This past week has been quite the geeky upgrade. It all started on Friday. Ok, technically that’s not “this week”, but it is within the past 7 days. 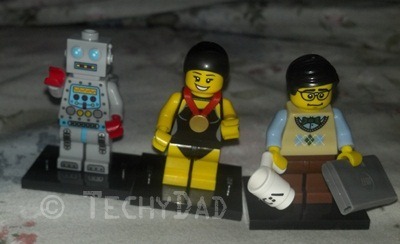 As part of my birthday present, I received three Lego minifigures that I’m going to use to create some Lego tie clips. Sunday was the day that I took apart my laptop to fix a problem deep inside. Though I believe I fixed that problem, it turned out that the power cord was faulty too. A replacement has been ordered and is on its way. Still, the lessons learned from that operation were well worth the effort. Sunday night, I introduced NHL to Back To The Future. He’s been hooked since that night. We watched BTTF parts 2 and 3 and he is in love with the entire trilogy. I was so proud of NHL when, after Marty was apparently shot and killed, he guessed that Marty had copied a scene from A Fistful of Dollars starring Clint Eastwood (a scene shown in the previous movie) and had a metal plate under his shirt. He could barely contain himself as the third movie reached its climax. Check that, he didn’t contain himself. He was up off the couch, jumping up and down, and cheering Doc Brown and Marty McFly on. Finally, I had a small geeky upgrade of my own. For years, I’ve heard people say how great the Doctor Who series is. I meant to watch it, but never seemed to get a chance. With six seasons available on Netflix, though, I decided it was time to watch. I’m only three episodes in, but I love it already. The weirdness, time travel, and plot lines have me wanting more. Given that I still have 80 episodes to watch before I catch up, I should be good for some time. Have you or your kids tried any new geeky pursuits?